In what is merely the latest example of Sinclair Broadcasting’s mission to imbue local news with pro-Trump propaganda, Sinclair's Full Measure invited President Donald Trump on to make unchecked, demonstrably false claims, tout his non-existent legislative successes, and attack the news media. 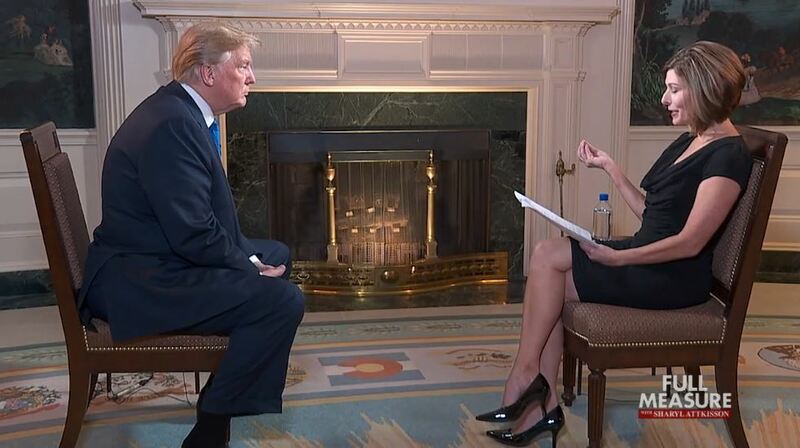 During the November 5 interview, host Sharyl Attkisson, a former CBS anchor with a history of flawed reporting and right-wing advocacy, asked few contentious or adversarial questions of the president and issued no follow-ups to Trump’s false claim that the Trump-Russia dossier is “phony” and “fake,” his inaccurate claim that his administration has had more military successes against ISIS than during the entire presidency of Barack Obama, or his erroneous claim that his administration has enacted “almost a record” number of bills. Trump also attacked the “fake” media during the interview, continuing his war on the press. This is not Trump’s first time on Full Measure. During a previous appearance on the show, when he was a candidate for president, Trump said he was entertaining the idea of “banning reporters from certain events. As president, Trump has not given a one-on-one interview with a serious journalist since May, and instead has granted interviews only to fawning sycophants on sympathetic networks, including Sinclair. Sinclair has benefited from Trump, thanks to the deregulatory efforts of Trump’s Federal Communications Commission (FCC). The organization has announced plans to acquire Tribune Media’s dozens of local television stations, a controversial deal at least four states are urging the FCC to reject. Last week the FCC helped Sinclair towards achieving that acquisition when it voted along party lines to eliminate a rule that mandated local news stations maintain offices within the communities they serve. Even before Trump won the election, Sinclair had aligned itself with him and reportedly struck a deal for greater press access to the then-candidate in exchange for better coverage. Attkisson’s interview is just the latest manifestation of a growing Sinclair-FCC partnership that exploits Americans’ trust in local news for political gain.